As well as running the Crown, Mr. Howes had a responsible position at the Upper Brewery when it was the business carried out by the late Mr. Thomas Loomb Taylor. After leaving the Crown, Mr. and Mrs. Howes took up farming and lived on the road to Wortham Ling. They then retired to a pretty villa in Scole. On Tuesday 30th June 1891, Mrs. Sarah Howes committed suicide by putting a towel around her neck and hanging from the foot of a bedstead. She was 74 years of age. Her doctor confirmed that he had seen her some days previously and was concerned about her state of mind. Suicide whilst of unsound mind was the verdict of the jury. Mr Alecock advertised the house available to let, with immediate possession, since he was about to retire - 27th August 1836. On the night of Saturday 21st November 1863, the premises were broken into. The following morning it was discovered that one bottle of brandy, one of cloves and one of whiskey had been taken. 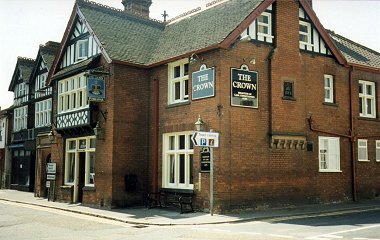 Police-sergeant Boutell at once suspected the under-ostler at the Crown, William Harrison. Comparing his boots with footmarks in the yard, under the window that had been broken to gain entry, they were found to match exactly. Harrison was committed to trial at the next assizes. On Wednesday 27th November 1907, William Tobel Peskett, was charged with allowing two dogs onto the highway without collars and the owners name inscribed thereon. The dogs were in fact harrier hounds, the property of Mr. S. Hillwood and as puppies, were being in the charge of Mr. Peskett for the purposes of `being walked'. It was argued that pack hounds were exempt from the regulations regarding collars. The Bench disagreed in this case and fined Mr. Peskett 1s. A presentation was made at the Crown Hotel on Wednesday 19th October 1955, to Mr. and Mrs. A. Chalkley, who left the hotel to live in Norwich. Mr. Chalkley was a former West Ham United footballer. Advertised as a Family & Commercial Hotel in early 1900's. reverting to the OLD CROWN.